A huge tree was uprooted and damaged cars in a carpark near Block 203 Hougang Street 21 during a heavy storm on Friday afternoon (Sep 21). Stomper Maria alerted Stomp to a video of the incident that was circulating online. In the video, a tree can be seen fallen across a road in the carpark, with soil and debris strewn around. The tree had also fallen over a parked van. The scene had attracted the attention of several passers-by, who can be heard exclaiming in Hokkien about the damage to vehicles. 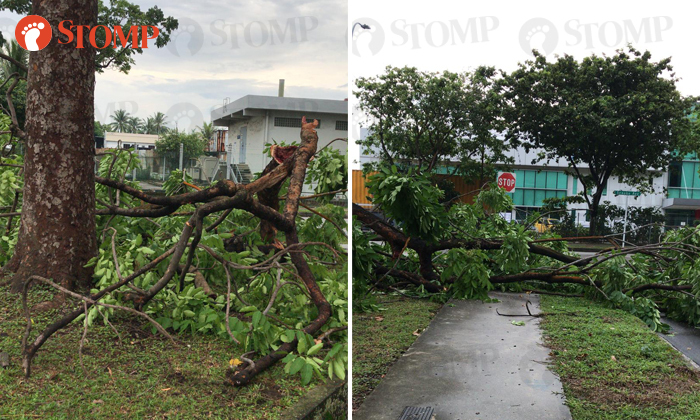 In response to a Stomp query, Aljunied-Hougang Town Council said it learned of the fallen tree shortly after the incident occurred and attended to the matter on site. A spokesman for Aljunied-Hougang Town Council told Stomp: "There were no injuries arising from this incident. "We are currently awaiting the investigation/assessment report from our horticulture/arborist contractor following the completion of investigations and do not expect we will have any further comments before then." The Town Council is also in contact with the car owners whose cars were damaged in the incident, added the spokesman. On the same afternoon, Stomper Richard reported seeing fallen trees along Senoko Way as a result of the downpour.